← Wine tastings are good. It’s been a while and lot has been going on through the holidays and what not. But I’m back and going to try to get this kicked up again. To my few readers, thank you for you for your patience 🙂 and happy valentine’s day! Prison. So I’ve heard or read about 1000 (slight exaggeration) types of cleanses or detoxes that exist. Some friends have tried some and have had relatively positive things to say about how they felt after; “clean” “awesome” “light” blah blah blah… good for them. I’m not one for a cleanse/detox or a diet because I have no willpower when it comes to delicious food! After about 3 months of some serious alcohol, food, late night, travel, celebration, mourn, Super Bowl, and general Tuesday night happens I woke up last Monday feeling just full of yuck. I decided to try a (gasp) cleanse that my dear trustworthy takes-care-of-all-your-vanity/skin needs, Svetlana, told me about one that she does a couple times a year. the Seneca Indian cleanse. It was 4 days of my life… how can I not have ‘food willpower’ for 4 simple days? I did it, it was fine. VERY BORING. But I did it. Not sure I’d do it again, but it felt good to get rid of the holiday toxins and a couple lbs. That biscotti with the perfect cup of freshly brewed french press coffee… what else can a girl ask for on a silly day like today. Please do yourself a favor and bust this recipe out…it’s seriously fantastic. Preheat the oven to 325° and position racks in the upper and lower thirds of the oven. Spread the hazelnuts on a baking sheet and toast for 12 to 14 minutes, until the skins blister. Let cool, then transfer the nuts to a kitchen towel and rub off as much of the skins as possible. Transfer the nuts to a cutting board and coarsely chop. Meanwhile, in a microwave-safe bowl, cover the figs with water and microwave at high power for 1 minute, just until the figs are plump. Drain well. Trim off the stem ends and slice the figs 1/8 inch thick. In the bowl of a standing electric mixer fitted with the paddle, beat the butter with the sugar at medium speed until smooth. Beat in the eggs. In a small bowl, whisk the flour with the baking powder and salt. Add the dry ingredients to the butter mixture and beat at low speed until combined. Add the nuts and figs and beat until combined. Line 2 large baking sheets with parchment paper. Transfer the dough to a work surface and roll into six 10-by-1 1/2-inch logs. Arrange the logs on the baking sheets and bake for 30 minutes, or until golden and firm. Let the logs cool for 15 minutes. On a work surface, using a serrated knife, slice the logs on the diagonal 2/3 inch thick. Arrange the biscotti cut sides up on the baking sheets and bake for about 18 minutes, until lightly browned. Let the biscotti cool, then serve or store. Make Ahead The biscotti can be stored in an airtight container at room temperature for up to 2 weeks. 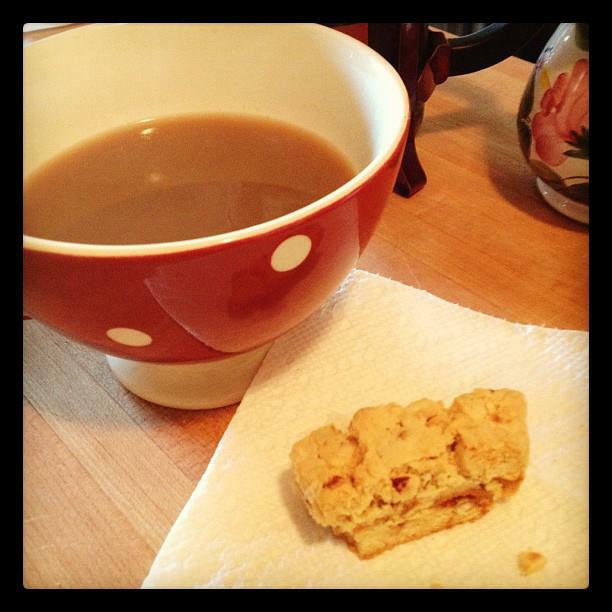 This entry was posted in baking, cooking, Uncategorized and tagged baking, biscotti, breakfast. Bookmark the permalink.